We recently spent some time reviewing Fairfax County bikeshare usage data from Capital Bikeshare for the first 5 months of 2018. Usage data for the entire Metro DC system are available for download at the CaBi website. Fields include start and end station, duration, membership type (Member or Casual) and bike number. We filtered out just the Fairfax County station data and summarized based on the start station name. By far the most popular start station was the Reston Station located at the Reston-Wiehle Metro station. The next most popular start station was the Tysons Corner Station located next to the Metro station. Third most popular was the Reston Town Center Transit Station. 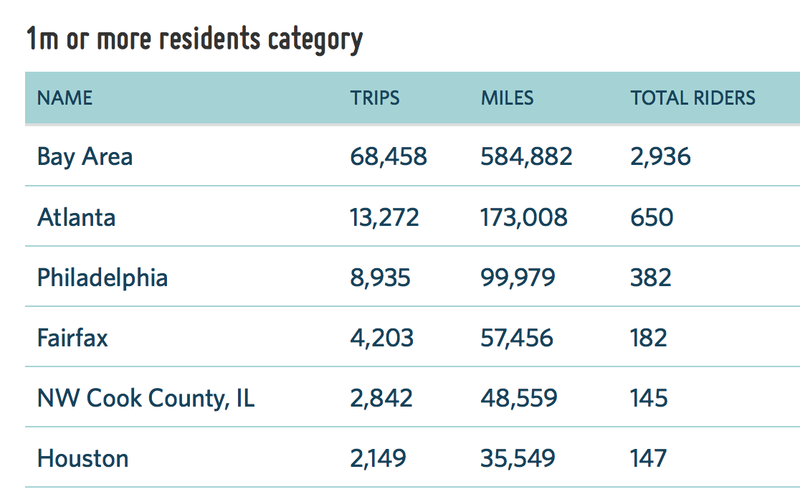 Clearly bikeshare is closely related to transit and major employment centers. People are likely taking Metro to the Reston-Wiehle station and riding the short distance to the Reston Town Center. In Tysons they are mostly riding from the Tysons Corner station to the Westpark/Jones Branch area, which is difficult to access without a bike; buses take forever and it's a very long walk. 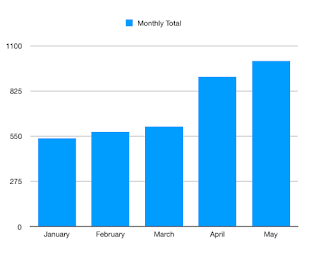 Below is a graph showing total trips for the Fairfax County stations so far this year. If you have programming skills and would like to do further analysis of the data, it's available online at the Capital Bikeshare site. FABB volunteers at the BTWD 2018 pit stop in Mount Vernon enjoyed talked to local rider Bob Sachs. It was hard not to like talking to someone who says he just loves to ride bikes and rides everywhere he can. 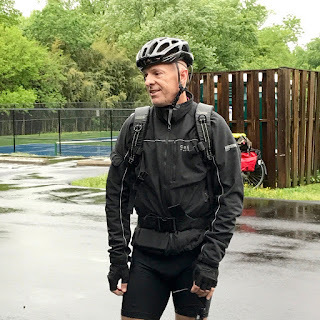 Trying to pin him down on what he most likes about bicycling on that soggy Bike to Work Day, our volunteers had to laugh when he first said “Rain!” Bob then added that riding helped to clear his occasionally befuddled head. Bob would like to see more bike lanes and sharrows in the county to make it easier and safer to ride. He also supports better driver education to make sure everyone is aware of the rules of the road regarding bicyclists. 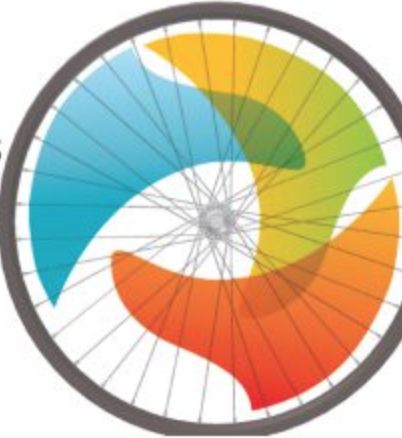 FABB actively advocates for Fairfax County and the Virginia Department of Transportation to continue adding bike lanes, sharrows, and even shoulders and wide curb lanes to routes in and around the Mt. Vernon area. We also encourage people who ride bikes or love someone who does to make their voices heard on improving bicycling infrastructure and safety at public hearings. FABB publicizes such meetings on our social media, so please be sure to follow FABB, share our posts, and give us a like. 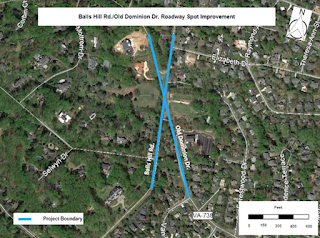 Dranesville District Supervisor John Foust and the Fairfax County Department of Transportation (FCDOT) will hold a public information meeting on the Balls Hill Road and Old Dominion Drive Improvement Project this Thursday, June 28, 2018. The planned project calls for realigning the intersection, improved traffic signals, and approximately 1.5 miles of new bike lanes and 2,750 feet of pedestrian walkways. You can find details on the project here. 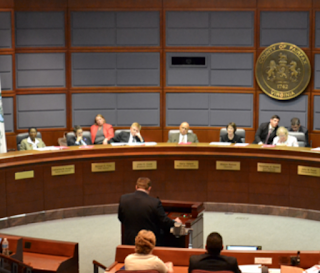 The meeting will be at the Cooper Middle School, 977 Balls Hill Road, in McLean, and will start at 7:00 pm. If you are unable to attend, you have until July 13, 2018 to submit comments on the project website. That's 1.5 miles of new bike lanes, people! Let's get out there and show our support. FABB wants people to know about a cool bike-related event this coming Saturday, June 30, at the Angelika Film Center in the Mosaic District. 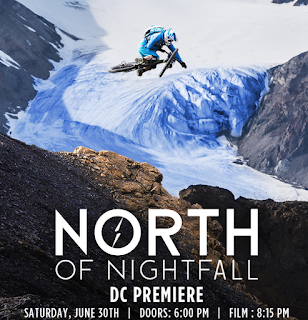 For our members who like to mountain bike or just enjoy movies about nature, you should plan now to attend the local area premier of the Red Bull Media House film, North of Nightfall, a breathtaking look at mountain biking among glaciers far above the Artic Circle. 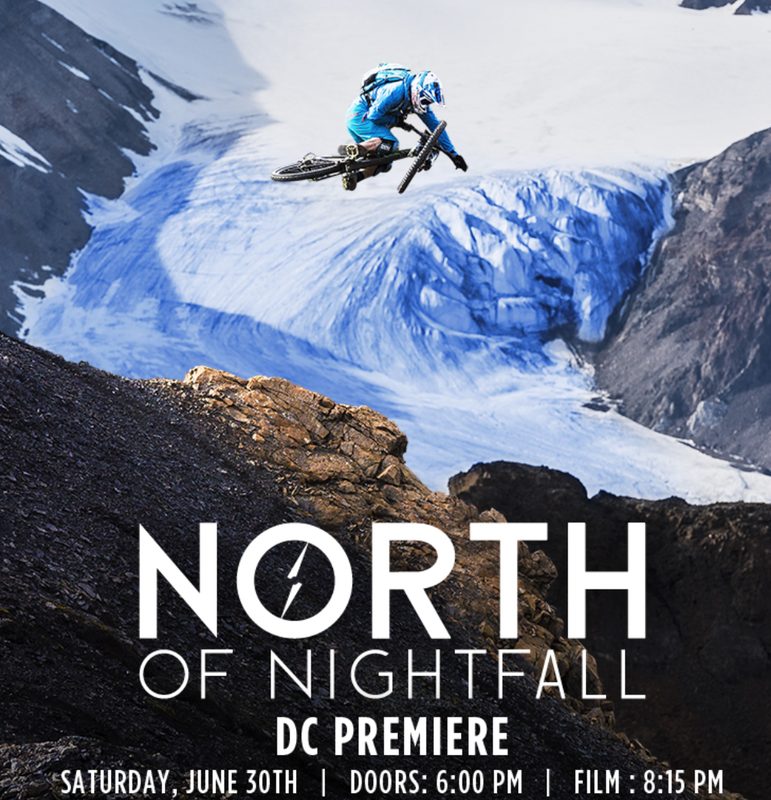 The film features freeride mountain bikers doing amazing things among some of the most spectacular landscapes and dramatic ecosystems imaginable. You can catch the official trailer here. The premiere will be at 8:15 pm on the 30th at the Angelika Film Center at 2911 District Avenue in Fairfax. Tickets are $15.00 and are available here. The best part of this event is that some of the proceeds from the premiere will go to support the Mid-Atlantic Off-Road Enthusiasts (MORE), who are well known for their work advocating for and maintaining trails. Plus ticket holders will be eligible for drawings for a prize box, a Canyon bike, or a VIP Red Bull Rampage Experience. The ticket includes a welcome reception that runs from 6:00 to 8:00 pm when the doors open for the screening. 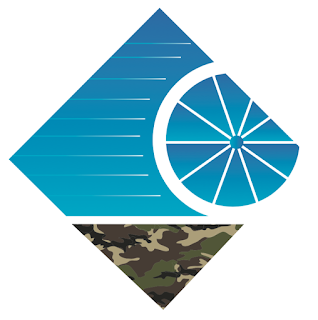 Hey, FABB members, now is a great time to register for the 9th Annual Cycle Fest Ride for Veterans, which will be held on Sunday, September 16, 2018, at the Molon Lave Vineyards in Warrenton. Sponsored by the Jewish Community Center of Northern Virginia, this is a supported ride through the beautiful countryside around Warrenton. There are options for rides of 18, 44, and 64 miles (metric century) with plenty of rest stops and snacks. After the ride, bicyclists and their families and friends can relax at the vineyard for lunch, wine, and live music by Seth Kibel and his swinging band. Everyone who registers for the ride will also be entered into a raffle for wine, art, and a new bike ($1,500 value!). wounded veterans with transformative art experiences in ceramics and metals. A program of local, non-profit The Art League, IMPart is part of CREATIVE FORCES - NEA Military Healing Arts Network. For details on routes and launch times, visit jccnv.org/cyclefest. If you register by August 1, the cost will be $50 for the 18-mile ride and $ 65 for the 44- and 64-mile routes. After August 2, the cost will increase to $55 for the 18-mile route and $80 for the other two rides. But, don’t wait! Space is limited! Register on bikereg.com/cyclefest2018 (service fee applies) or complete the registration form here and return it to the Jewish Community Center of Northern Virginia, 8900 Little River Turnpike, Fairfax, VA 22031. FABB thought that Burke resident Jeanne Brown Leonard looked familiar when we spent a few minutes talking to her on Bike to Work Day 2018. This is because we’ve spoken to her on past BTWDs, which she tries to support every year. 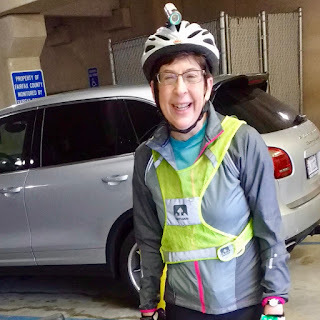 As she has said in the past, Jeanne rides because she loves the exercise and how being outside on her bike makes her feel. 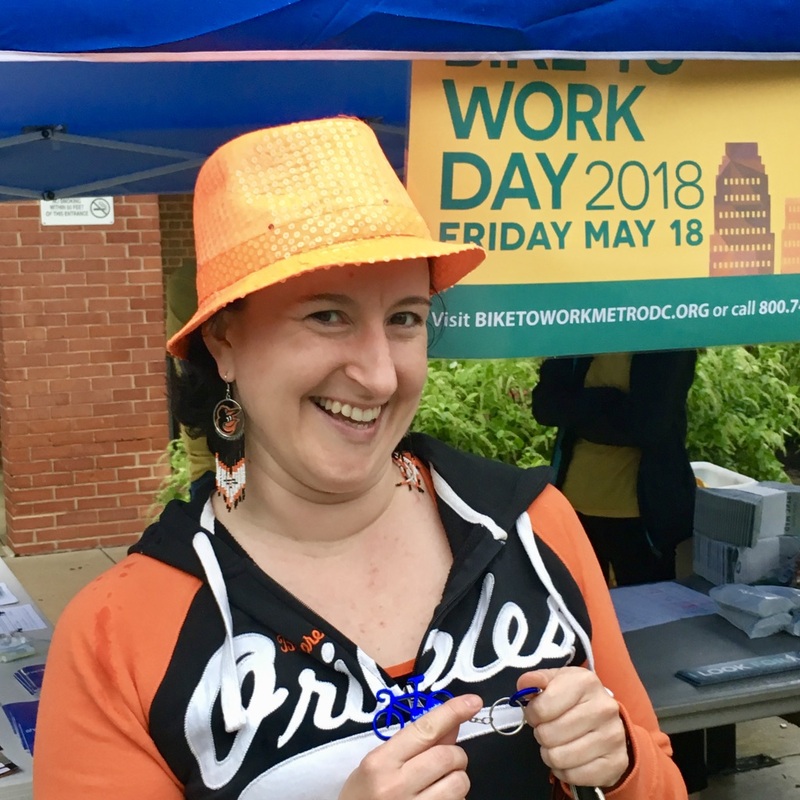 A considerate rider herself, Jeanne thinks that bicycling would be much better in Fairfax County if all bicyclists would obey the law and trail regulations. FABB also believes that knowing and abiding by the rules of the road is key to making bicycling a safer transportation option. It also helps make the county’s many multi-use trails more enjoyable for all. We encourage all Fairfax cyclists to ride with safety and consideration in mind. We look forward to talking to Jeanne again next year (and hopefully no rain gear will be needed). Alexandria native Ben Grimes spoke to FABB at a BTWD 2018 pit stop after dodging raindrops during his commute to work in the District. In addition to commuting, Ben rides for fun and exercise. Fresh air is the great attraction for Ben when he is out on his bike. In response to our question about what the county could do to make bicycling better, Ben said he would like to see more protected bike lanes. We have some good news for Ben and others who bike in and around Alexandria and the Mount Vernon District. As part of this summer’s repaving and restriping program the Virginia and Fairfax County Departments of Transportation are planning to add buffered bike lanes on Hooes, Pohick, Telegraph, Armistead, and Frye Roads. This should make riding in these areas safer and more comfortable for bicyclists and motorists. 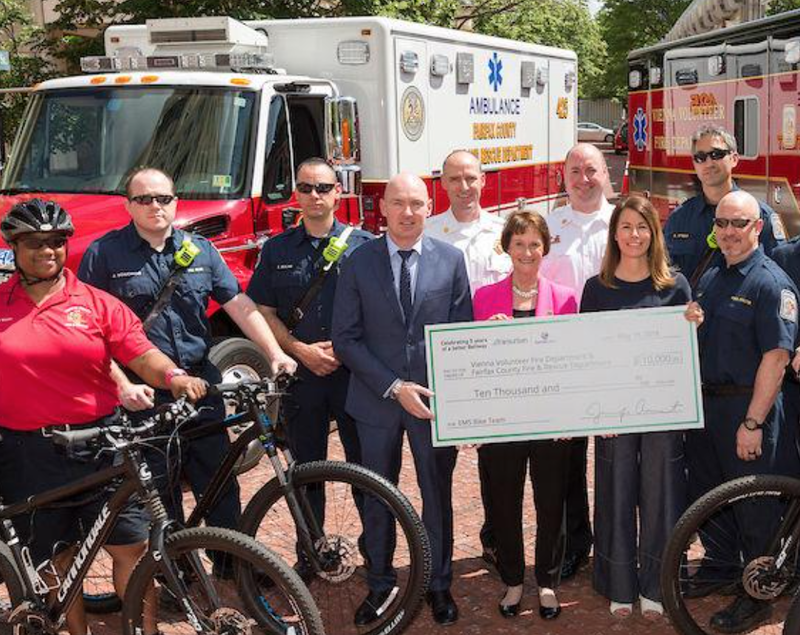 FABB congratulates the Fairfax County Fire and Rescue Department and the Vienna Volunteer Fire Department for recently winning a $10,000 grant to expand their joint emergency medical services bicycle team. The EMS Bike Team is a shared program between all members of the Fairfax County Volunteer Fire and Rescue Association, a partnership of the county’s 12 volunteer fire and rescue departments. As bicyclists and others know, first responders on bikes are able to quickly move to assist in medical emergencies that occur in locations that are difficult to access for larger vehicles or areas where ambulances and fire engines might be slowed down by traffic and crowds. 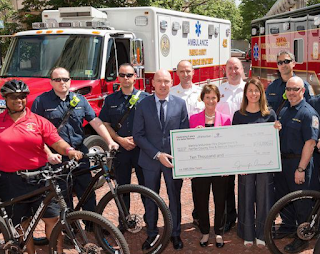 The grant, provided by toll road network manager Transurban, was presented to Fairfax County Board of Supervisors Chairman Sharon Bulova, Vienna Mayor Laurie DiRocco, and personnel from both fire departments in late May. Get the full story from the Fairfax Times here. 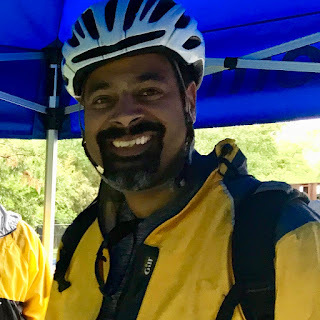 In the three weeks since our last post on the National Bike Challenge, 16 more Fairfax County riders have signed up to help maintain our area’s strong performance. 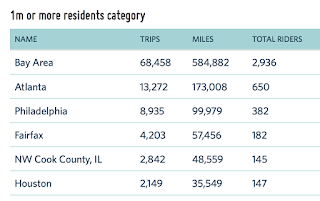 Fairfax County is still holding on to fourth place in the nation among communities of a million or more residents. 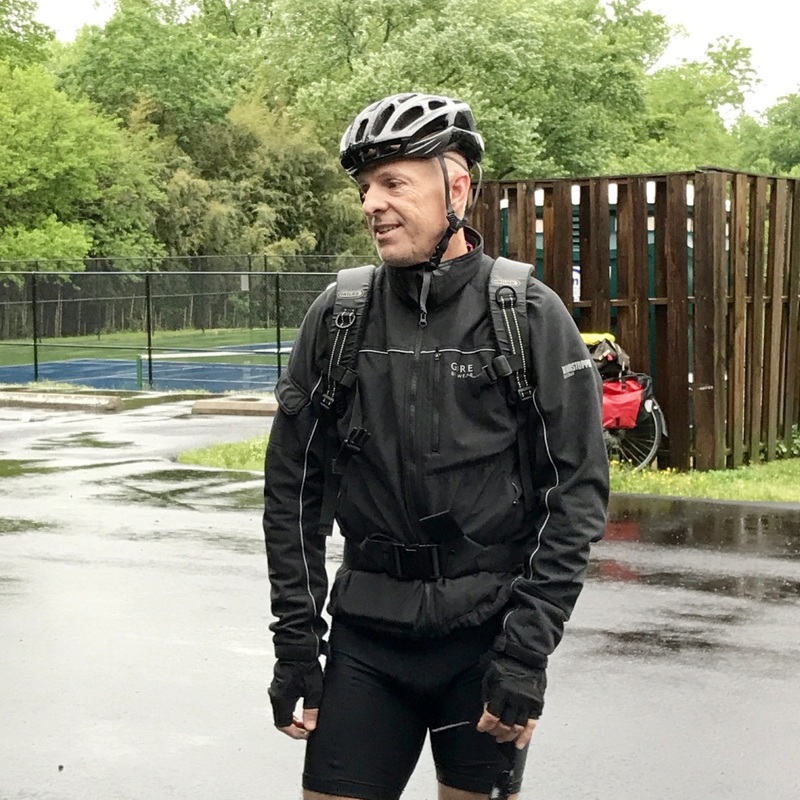 More amazingly, over the past three weeks Fairfax County riders participating in the challenge have ridden nearly 30,000 miles in just over 2,000 trips. Since the start of the challenge on May 1, the 182 Fairfax riders have taken 4,203 trips and logged 57,456 miles. Keep up the great work, everyone! You can still sign up here to join the fun. The challenge runs through September and its a great excuse to introduce new riders the joy of biking. The Virginia Department of Transportation (VDOT) and the Fairfax County Board of Supervisors will conduct a joint public hearing on the Secondary Six-Year Improvement Plan for fiscal years 2019 through 2024. If you would like an advanced look at the proposed plan, copies may be reviewed at VDOT’s Northern Virginia District Office, 4975 Alliance Drive, in Fairfax. 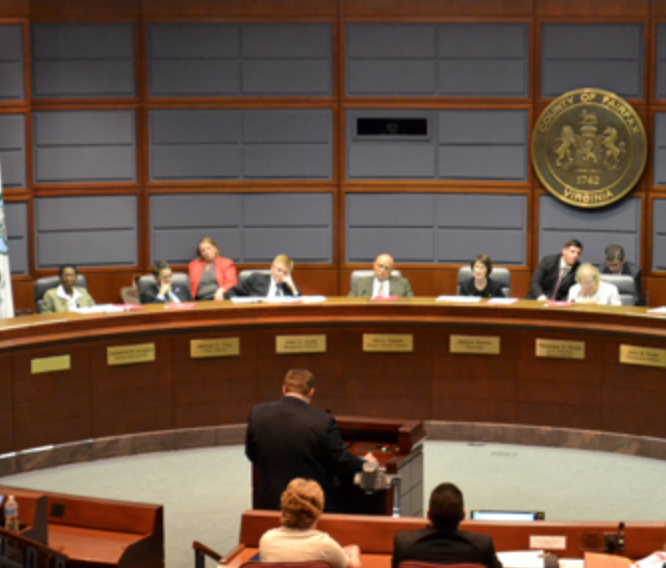 The hearing will be on Tuesday, June 19, 2018, at 3 p.m. in the Board Auditorium, Fairfax County Government Center, 12000 Government Center Parkway in Fairfax. During the soggy Bike to Work Day at the McLean Pit Stop, FABB had the pleasure of talking to enthusiastic rider and Orioles fan, Maria Bissex. A McLean resident, Maria told us that she bikes for exercise and to be out in nature. She also likes to do charity rides when she can. Her favorite rides are on the many trails in the county, and she especially loves the W&OD trail. In response to our question about what she likes most about bicycling, Maria told us that biking clears her mind and makes her feel energized. As far as making bicycling better in Fairfax County goes, Maria would like to see more connected trails and more bike lines. More bike lanes and important connections are coming to the Mclean and Tysons areas. 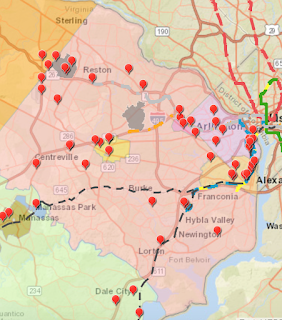 Next week, on Thursday, June 14, from 7:00 to 9:00 p.m. at the George C. Marshall High School, 7731 Leesburg Pike, in Falls Church, the Virginia Department of Transportation (VDOT) will hold a public hearing on a project to connect Rt. 123 and Tysons Corner Center. The plans include a 10-foot shared-use path along Old Meadow Road from the McLean Metro Station leading to a pedestrian/bicycle bridge over I-495 to connect to Tysons One place and Fashion Boulevard. FABB hopes local residents will attend the meeting and show their support for these projects. In just a couple weeks, the Northern Virginia Transportation Authority (NVTA) will take action on its inaugural FY2018-2023 Six Year Program. During the public comment period, the Authority staff received more than 1,200 comments on the 60 candidate projects (thanks for speaking up.) They have since worked diligently to incorporate these comments into their project funding recommendations. Two projects that included new bike facilities made it into the top ten. Fairfax County’s Route 29 Widening Project, Phase II (Union Mill Road to Buckley's Gate Drive) was ranked eighth. Rolling Road Widening (Hunter Village Drive to Old Keene Mill Road) came in at tenth. If you are curious, you can see a list of all of the NVTA staff recommendations on the draft FY 2018-2023 Six Year Program here. Time to mark your calendars for FABB’s June meeting. The evening will be focused on the Tysons area and neighboring parts of McLean, Falls Church, and Providence District. As usual, the monthly meeting will feature a Fairfax County Department of Transportation update on bicycle-related projects in the area, including the one to connect Tysons Corner Center and Route 123 at the McLean Metro Stop and the recently opened Rt. 7-Dulles Toll Road crossing. Access Tysons also will be joining us to talk about their initiatives to promote more and better transportation alternatives in and around “America’s next great city.” A representative from Providence District Supervisor Smyth’s office tentatively plans to be there to speak about similar issues in neighboring Providence District. As always, there will be time for discussion involving all of those in attendance. The meeting will be on Wednesday, June 20, from 7:30 to 9:30 pm at the Tysons-Pimmitt Regional Library, 7584 Leesburg Pike, Falls Church. See you there. 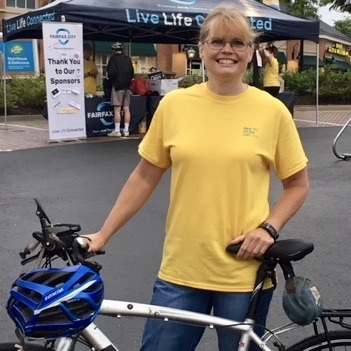 Debbie Skeins, who has participated in numerous Bike to Work Days, lives in Fairfax City and likes to ride "anywhere I can." She occasionally commutes by bike to her work in Merrifield. More often, she rides in and around Fairfax City for everyday trips and errands and then into other parts of the county for recreation. Debbie told us she rides because "it's enjoyable… and you are killing two birds with one stone. It's good for the environment and it makes you feel better." When asked what she likes most about riding, Debbie said, "The feeling of freedom from being on a bike." When asked what would make it easier and safer to ride, she said, "More connected trails. Some just end and you can't easily find the next one." 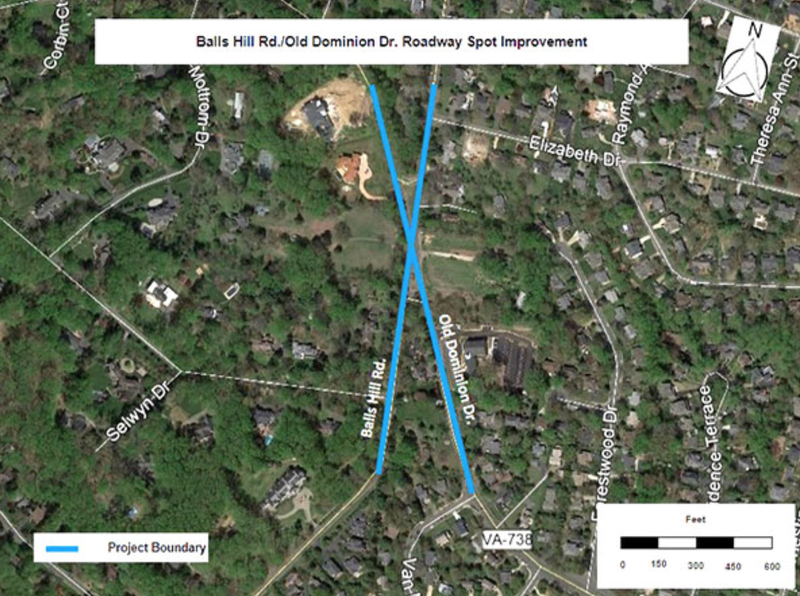 As part of FABB’s advocacy for the I-66 Outside the Beltway parallel trail, we have been working with Fairfax County and the Virginia Department of Transportation to ensure that such trail connections are included in this major project. 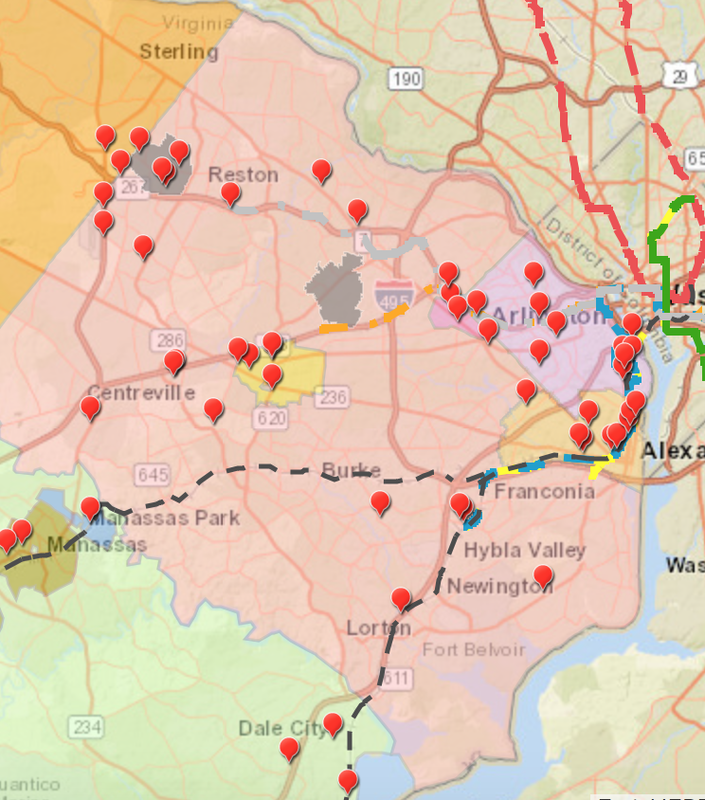 As many of you know, Fairfax City has received I-66 Concessionaire funding to construct connections from the George Snyder Trail Project to the VDOT shared use path along Route 123. When the I-66 parallel trail is completed, this connection will allow George Snyder Trail users the opportunity to travel east into Washington, DC, or west to Haymarket along the I-66 corridor. Public outreach on and design of the connections are expected to start this summer, so check back with FABB's social media for announcements.